Young at Heartland, Heartland Theatre’s senior acting troupe, is now a teenager! As YAH celebrates its 13th year of "continuing education, creative self-expression, and community outreach" through the vehicle of theater, the troupe will once again show off their talents in a performance at Heartland Theatre. Young at Heartland's Fall Showcase will take the stage at Heartland Theatre on Wednesday, October 19 at 7:30 pm. There is no set charge for admission, although donations are accepted at the door to help with program expenses. Note that these performances tend to be well-attended, so you are advised to be there early to get a good seat. If you are unable to attend the evening performance, Young at Heartland will offer another show open to the public at the Normal Public Library at 2 pm on October 28. Every day brings us choices, some small and others big, so the Young at Heartland senior acting troupe’s program will be exploring the complications and pleasures of Life's Choices. 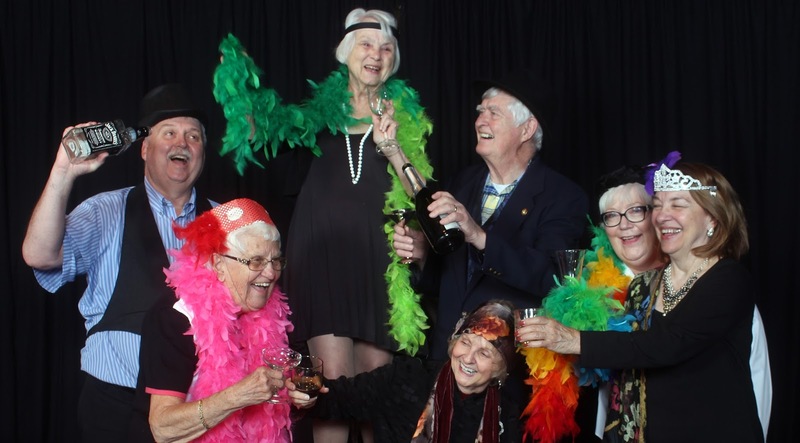 These brand new short scenes and plays are performed by the Young at Heartland senior acting troupe traveling through our community delivering lighthearted fun. Come see how they light up the stage. Heartland's website indicates that the scenes being performed include several pieces by members of the troupe, including Cemetery Walk and Goosed by Bruce Boeck, Going Postal by Lynda Straw, Helpful Hints and What's for Dinner? by Elsie Cadieux Skinfall and Telephone Tango by Joy Schuler and 'Tis The Season by Holly Klass. The actors in the troupe have participated in a two-month acting workshop led by retired Illinois State University professor Sandra Zielinski, with ISU alum Terri Whisenhunt assisting. For more information (and more pictures) of the irrepressible Young at Heartland acting ensemble, click here.